Assuming Minor (1) has indeed bottomed, that places us in wave 1-up of A-up of Minor (2) up. One-minute charts seem to indicate that wave 1-up of A may have a little more room to run. In a perfect world, we would see it at least tag the 1150's before completion, although it looks like it might even want to reach all the way up to tag the top line of the ending diagonal (in blue, low 1160's). The normal retracement for wave 2-down would be 40-62%, which, if wave 1-up topped right here, would place the retracement target range in the 1102-1119 zone. Obviously if 1-up still has more legs, then that range will accordingly be pulled higher. I have also drawn up a 1-minute chart of the Philadelphia Bank Index (BKX). The BKX was a fantastic leading indicator during the 2007-2009 bear market, so it may be helpful to track it now. It's hard to label the structure in the BKX as anything other than impulsive (an impulse wave moves in the same direction as the next larger trend, so this structure seems to confirm our view that Minor wave (2) up has started). So the BKX sports a pretty well-defined five-wave move up, which still looks like it needs a couple more up-down sequences, followed by a lunge higher, to complete (see chart). 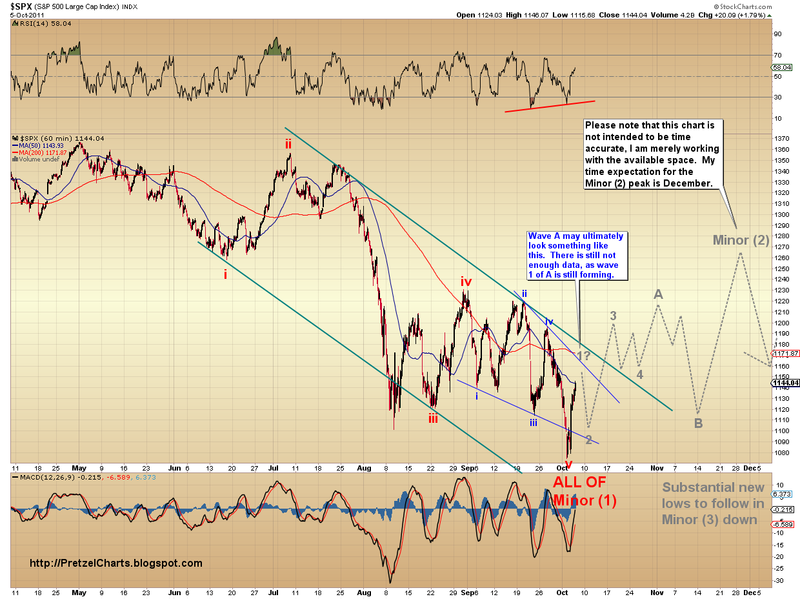 If this count is accurate, the SPX should follow a similar track. A break of the lower red trend-channel line (shown on both the SPX and BKX charts) will likely be our first clue that wave 2-down of A-up is starting. I do want to stress that these counts are all preliminary: the first portion of major swings in trend is always the toughest, since there are no larger waves yet formed in the new trend to use for comparison. Also, it appears that we are still forming the third wave of wave 1-up... so combining that fact with the lack of larger waves makes it difficult to assign targets with a high level of confidence. The best analysis I'm able to apply to the charts (given the limited wave form) says wave 1-up of A has a little more to run before completion -- but my gut says that there may be enough fuel in the form of short-covering to drive it even higher. Whipsaws like the one we had on Monday can sometimes surprise to the upside. Once the move gets a little more mature, the targets will become more accurate. Trade safe! on your last slide don't you mean "...meaning a multi-month rally should now unfold against the 1074 print low" ??? You wrote "1174". Just checking. Otherwise; spot on!!! Lol! Thanks, yes I meant 1074. Darn typos! You are welcome. BTW, your blue upper diagonal line has today 10/6 cross the S&P500 at 1165. The day ended at 1164.97. Is that a coincidence or just darn accurate??? I'm still studying the charts, but have some family time to attend to at the moment -- so tomorrow's update will probably be posted late... but first glance at the charts says we might *still* have room to run. If so, it's possible that we are seeing ALL OF the A wave unfold right now. That would jive if a lot were caught short after the whipsaw, too. I'll have to examine everything more closely later. Very intriguing work, looks very accurate. Have you performed similar analysis over the past three years? Track records? As far as I understand you are predicting some recovery until year-end and then a substantial decline early in 2012. Is my interpretation correct? I assume that this would be the case without any sort of "external" intervention or stimulus (e.g. Fed QE), right? If so, how would you correlate predictions you may have made versus actuals during QE1 and QE2? Thank you, your approach is very detailed and educational. Thanks. Yes, your interpretation is correct. Though I sometimes cite time targets, my approach is based on structure *first*. With Elliott, I've found the time frames can vary greatly, so I simply track the pattern each day, and whenever the form looks like its nearing completion, I call what I see. 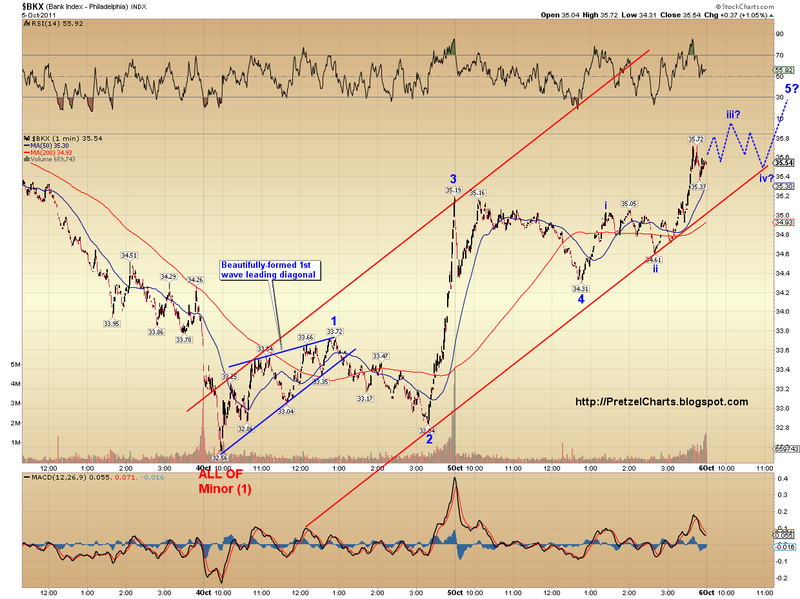 I've been utilizing Elliott Wave for a little more than a decade. I was very active on Capitalstool.com during the last bear, and very successful with my predictions. I took most of the bull market off, though, as I used my profits from the bear to relocate my family to Maui and spend some much-needed quality family time -- so I wasn't active much during QE1/2. 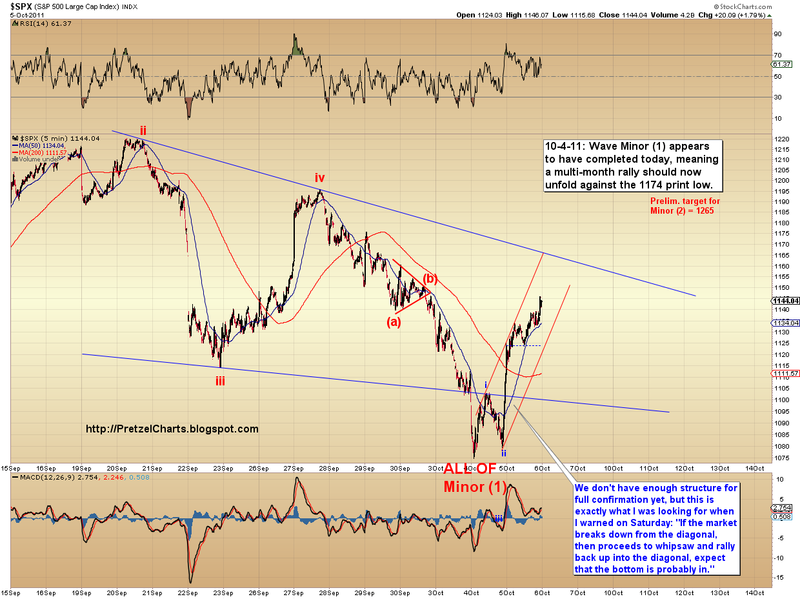 At this point, I don't think external intervention will stave off the next leg in the bear. I've been wrong before, but in my experience, the charts often lead the news, not vice versa. Check out my 300 year dollar study, posted on the pages to the right, for an example. I posted this chart right before the dollar took off. But a 300-year chart nails the turn, which blows my mind -- because how on earth did it "know" to form this 300 year pattern? So, I tend to think Ben, et al, will be powerless when the time comes. Just MHO. Great work! One does not have to be right 100% of the times to make a fortune in the markets, in fact, being right 50% of the time one can still make a fortune. I am new to Elliot Wave Analysis, and I find it very fascinating but very difficult to grasp the concepts. I would love to learn more about it. I mostly just use the price/volume action on the indexes and stocks to make my buy/sell decisions plus moving averages and a couple other indicators, along with my beloved candlestick patterns. It's mostly reactive/trend following in nature. 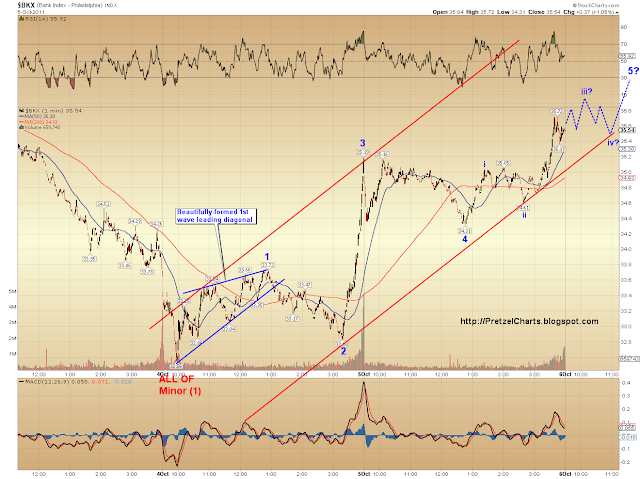 It'd be nice to know some Elliot Wave (predictive) :-) so I can "anticipate" things. Pretzel, would you consider doing a chart for silver/SLV? Also, why do you use the Nasdaq 100 (NDX) vs. the Nasdaq Composite (COMP)? Which one is better as far as being better predictive in nature? Hi Frank, thanks for the comments. I use the NDX because it's been the leader for a while; same reason I often chart the BKX. These two sometimes give earlier indications of where the broads are headed. I do try to educate through my posts, so you'll probably start to pick up a fair amount of Elliott Wave Theory as you follow along. Feel free to ask questions at any point, too.